1.1. Staff using the shuttle for University business trips must register here with your staff identity card and a research grant/cost centre code. Once registration is complete, simply present your University card for scanning by the driver. The card can be scanned multiple times for the same journey if you are travelling with others for the same purpose (eg scan three times if you are travelling with two other people). Internal recharges will be made to your department for your use of the shuttle. 1.2. Zoology and Experimental Psychology staff affected by the closure of the Tinbergen Building – register with your staff identity card and enter “Tinbergen” as the cost centre. Once registration is complete, simply present your University card for scanning by the driver. No internal recharges apply. 2.University departmental pool card – Some departments hold pool cards which can be borrowed as needed for University business trips. Simply present the pool card for scanning by the driver. The pool card can be scanned multiple times for the same journey if you are travelling with others for the same purpose (eg scan three times if you are travelling with two other people). Internal recharges will be made to your department for use of the shuttle. Departments that have a pool card (see table below). If your department requires pool cards/additional pool cards please contact info@sciencetransitshuttle.co.uk. 3. E-tickets – Staff can purchase e-tickets for personal use/commuting when not travelling on University business. E-tickets are purchased online and the e-ticket containing a QR code can either be printed or saved to a smart device for scanning by the driver. 4.Pre-paid paper tickets – Staff can purchase these for personal use/commuting when not travelling for University business. These tickets can also be purchased by departments and handed to staff as required. Books of tickets can be bought online here and collected from University Offices on Wellington Square, OX1 2JD or they can be bought by cash/card at University Club on Mansfield Road, OX1 3SZ. Present one ticket per trip to the driver. 5.Commuter cards – for regular commuting on the shuttle 13 week or 52 week commuter cards can be bought online and collected from University Office on Wellington Square, OX1 2JD. See tickets for purchasing a commuter card. Payment will be made by the University and repaid by the commuter by monthly salary deduction through the University’s Discounted Bus Pass Scheme. Present the commuter card for scanning by the driver. Please be aware that access to the shuttle requires stepping up into the vehicle and manually operating a sliding door. For the pilot period there is currently no provision for wheelchair users to access the shuttles. For those unable to use the minibus for business travel due to these access restrictions, please contact your Department. A reasonable adjustment would be for the Department to support with booking and paying for the trip by a wheelchair accessible taxi. The Government’s Access to Work scheme provides financial assistance to support people whose disabilities restrict their ability to travel. The University’s Equality and Diversity team can provide support. Please contact Caroline Moughton, Staff Disability Advisor, for information and advice. caroline.moughton@admin.ox.ac.uk Tel. 01865 (2)80687. 1.1. Zoology and Experimental Psychology students affected by the closure of Tinbergen – register with your student identity card and enter “Tinbergen” as the cost centre. Once registration is complete, simply present your University card for scanning by the driver. No internal charges apply. 1.2. Other students using the shuttle for University business trips – if you need to use the shuttle for University business trips where the University will cover the cost of travel, register here using your University card together with a research grant/cost centre code obtained from your department. Internal recharges will be made to your department for your use of the shuttle. 2. Pre-paid paper tickets – if you wish to use the shuttle for your personal trips/commuting then books of tickets can be bought online here and collected from University Offices on Wellington Square, OX1 2JD or tickets can be bought at University Club on Mansfield Road, OX1 3SZ. 3. E-tickets – if you wish to use the shuttle for your personal trips/commuting then e-tickets can be purchased. E-tickets are purchased online and the e-ticket containing a QR code can either be printed or saved to a smart device for scanning by the driver. 4. Commuter cards – for regular commuting on the shuttle, 13 week and 52 week commuter cards can be bought online and collected from University Offices on Wellington Square, OX1 2JD. 1.Arrange shuttle use with the department you are visiting – please discuss with the department whether you can travel with a registered user who can scan their University card or a pool card to cover your travel or whether the department can issue you with paper tickets to cover the required travel. 2. E-tickets – Visitors can purchase e-tickets. The tickets are purchased online and the e-ticket containing a QR code can either be printed or saved to a smart device for scanning by the driver. 3.Pre-paid paper tickets – Books of tickets can be bought online here and collected from University Offices on Wellington Square, OX1 2JD. Alternatively, buy tickets from University Club on Mansfield Road, OX1 3SZ or from Electron Café, Harwell Campus, OX11 0QS. Present one ticket per trip to the driver. 1. Harwell Campus Gold cards – these are for sale to organisations based at Harwell for use as a pool card and are valid for 52 weeks. Gold cards have already been issued to the following organisations (see table below). Additional gold cards can be bought online here and collected from Reception at Atlas Building, Harwell Campus, OX11 0QS. Present the Gold card for scanning by the driver. 2. E-tickets – Harwell staff can purchase e-tickets. The tickets are purchased online and the e-ticket containing a QR code can either be printed or saved to a smart device for scanning by the driver. 3. 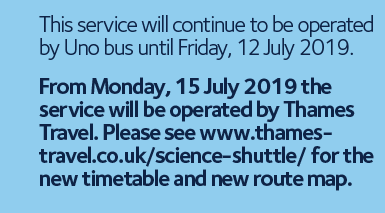 Commuter cards – for regular commuting on the shuttle, 13- or 52-week commuter cards can be bought online here and collected from Reception at Atlas Building, Harwell Campus, OX11 0QS. Present your commuter card for scanning by the driver. 4. Pre-paid paper tickets – Books of tickets can be bought online here and collected from Reception at Atlas Building, Harwell Campus or from University Offices on Wellington Square, OX1 3SZ. Alternatively, buy tickets at Electron Café, Harwell Campus. Present one ticket per trip to the driver.